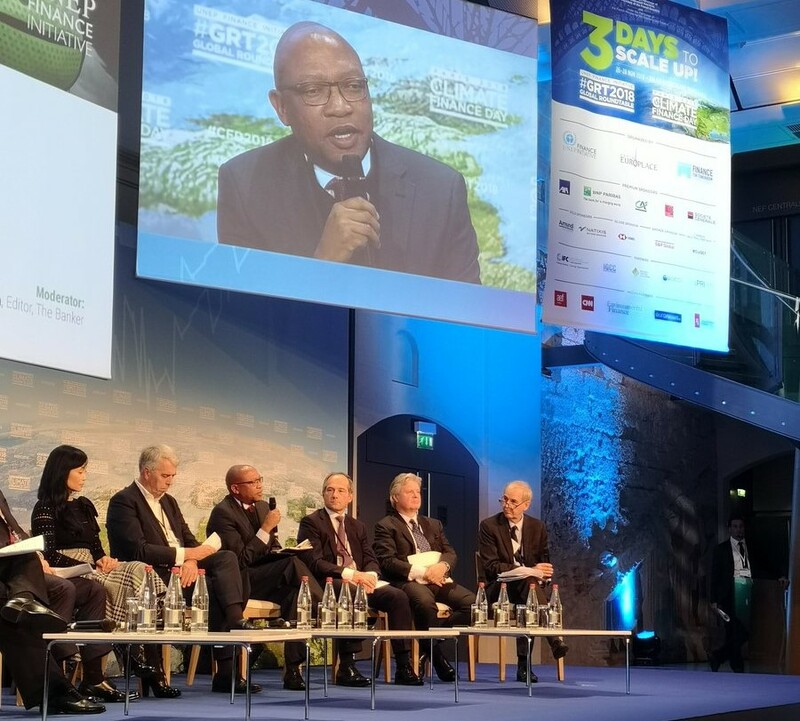 More than 500 delegates at the first day of UN Environment Finance Initiative (UNEP FI)’s Global Roundtable 2018 saw the launches of four major initiatives that will help mobilize the financing of the Sustainable Development Goals (SDGs) and the Paris Climate Agenda. The first day of the event—part of three days aimed at scaling up action from banks, insurers and investors on sustainable finance—also saw AXA Group announce the extension of its pioneering climate policies to its new AXA XL division, and heed the call from UNEP FI’s Principles for Sustainable Insurance (PSI) for its peers in the global insurance industry to form a coalition to commit to decarbonisation and climate resilience in both their insurance and investment activities, and to raise their climate ambition. In a bid to define the banking industry’s role and responsibilities in shaping a sustainable future, UNEP FI and 28 banks from around the world have together developed the Principles for Responsible Banking. The new framework launched today for a 6-month global public consultation. The 28 banks represent over USD 17 trillion in combined assets and 9 of their CEOs attended the launch. By committing to the new framework, banks will be aligning their business with the objectives of the SDGs and the Paris Climate Agreement. The principles provide the first global framework that guides the integration of sustainability across all business areas of a bank, from strategic to portfolio to transaction level. Watch the panel session with 9 of the core banks’ CEOs. Find out more here. The AXA Group, the French global insurer and founding signatory to the Principles for Sustainable Insurance (PSI) announced that its newly acquired subsidiary, XL Group—now known as AXA XL—will no longer underwrite the construction and operations of coal plants, coal mines, oil sands extraction and pipelines, as well as Arctic drilling. With its acquisition of XL last March, AXA is now the world’s largest commercial lines insurer, with a strong presence in North America. This commitment will represent over €100 million of premiums and it will be effective January 2020. Furthermore, AXA XL will implement AXA’s various investment exclusions they have pioneered, including coal, oil sands, tobacco, and controversial weapons. This represents an extra divestment of €660 million. AXA hopes that its decision to restrict insurance coverage will create further momentum in the insurance industry. AXA supports the call from UNEP FI’s Principles for Sustainable Insurance for the global insurance industry to collaborate under the PSI and form a coalition of insurers who would commit to actions on decarbonisation and climate resilience in both their insurance and investment activities, and raise their climate ambition in line with the goals of the Paris Agreement. Thomas Buberl, Group CEO, AXA said, “To tackle climate change, we must use every lever possible. This means implementing an ambitious strategy everywhere we can. This is why I am very proud to onboard AXA XL into adopting our sustainability strategy. Above all, our conviction has always been that the fight against climate change requires collective action, therefore AXA is happy to support the future UN PSI Climate Ambition Coalition.” Read more here. Watch Thomas Buberl making announcement here. UNEP FI’s Positive Impact Initiative unveiled a new report entitled “Rethinking Impact to Finance the SDGs”, a position paper on bridging the gap in financing for the Sustainable Development Goals. The report was launched at a session introduced by Frédéric Oudéa, CEO of Société Générale, a member of the initiative. The paper identifies a US$2.5 trillion financing gap in emerging markets and developing economies, and calls for the business and finance sector to embrace business models that focus on impact. Accompanying the report’s release are several tools for impact analysis and management: The Positive Impact Radar translates the SDGs into meaningful terms for business and finance. Positive Impact Model Frameworks provide guidance to apply holistic impact analysis across different financing products and asset classes. Read more about the report and accompanying tools here. The latest in a series of market analyses from the Fiduciary Duty in the 21st Century programme was published today at a session introduced by Bruno Le Maire, Minister of Economy and Finance, France and featuring Brune Poirson, Secretary of State, Ministry for the Ecological and Inclusive Transition. The roadmap sets out recommendations for the French market to build upon its leadership position and achieve further progress in mainstreaming responsible investment. Acknowledging recent achievements, such as the final adoption of the Action Plan for Business Growth and Transformation (PACTE), the roadmap recommends that the French market would benefit from fresh impetus in its approach to responsible investment. The Roadmap aims to strengthen French leadership in the transition towards a more sustainable financial system, one that aligns with the Paris Agreement and contributes to the achievement of the UN Sustainable Development Goals. The world’s first comprehensive tool linking environmental change with its consequences for the economy was presented for the first time today. The new web-based tool, called ENCORE (Exploring Natural Capital Opportunities, Risks and Exposure), will help global banks, investors and insurance firms assess exposure to the risks that environmental degradation, such as the pollution of oceans or destruction of forests, cause for economic activity. ENCORE’s comprehensive database covers 167 economic sectors and 21 ‘ecosystem services’, i.e. the benefits that nature provides to enable or facilitate business production. Global financial institutions such as FirstRand, VicSuper, and YES Bank are supporting the launch of the tool. Anders Nordheim, Programme Leader, UNEP FI said, “The role of nature in the economy must be better understood, quantified and protected by those who finance economic growth.” Read more here. Read the press release in English and French.